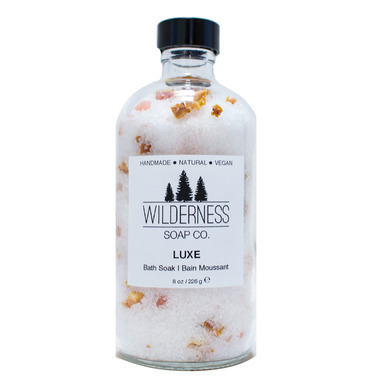 Unwind with the Wilderness Soap Co. Luxe Bath Soak. This luxurious bath soak is blended with Dead Sea Salts, Himalayan Pink Salts, dehydrated orange peel and infused with soothing essential oils of Eucalyptus and Peppermint. Feel good about relaxing in this natural, nutrient-rich, and moisturizing bath soak. It has a wonderful natural scent and it's gentle on sensitive skin. Gorgeous product! Giving it as a gift, so I can't try it, but now want to buy one for myself!